Background midi music is the tune to the song! How big are we? Very big! We are the only state to have coastlines on three different seas. Arctic Ocean, Pacific Ocean and Bering Sea. 1 year; 974 inches (Thompson Alaska, near Valdez). Purchased from Russia in 1867 for under 2 cents an acre. The plant grows well in most of Alaska's varied climate. It can change it's color from light brown to snow white. The willow ptarmigan was named Alaska's state bird in 1955. The evergreen is found throughout the southeastern and central areas of Alaska. King salmon weighing up to 100 lb. have been caught in Alaska. The king salmon is also known as the chinook salmon and is a popular sport fish. It became the state fish in 1962. It once was the primary form of transportation in most of Alaska. 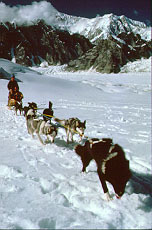 Today dog sled racing is a popular winter sport. It was adopted as the state sport in 1972. Alaska has a large deposit of jade, including an big mountain filled with dark green jade on the Seward Peninsula. The search for gold played a major role in shaping the history of Alaska, from the discovery of gold in Juneau to the great gold rush at Nome. Gold was named the state mineral in 1968. One of the plates available.